Filters, Image Blending and More Projectors by John Neville Cohen. Page 9 of ten pages. Some points about filters, apart from changing colours of the projected images, other uses might not be so obvious, for example plate 49 (Poetic Portfolio) is a case where the colour change was more effective than any masking. The idea was to combine the lamb slide with one of clouds, but in order to mask the white clouds where they overlapped the white lambs it was found that far too much brilliance was lost. But by changing the clouds to blue no masking was then needed. 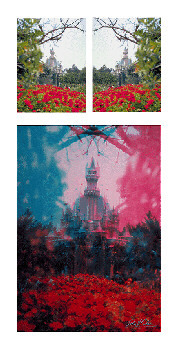 Plate 30 (above) was created by photographing the projected two identical slides of the Disneyland castle. However one slide was projected the wrong way round, with the two towers aligned, hoping to create a more magical look. It turned out to be rather disappointing! It looked very obvious that one slide was on top of the other, none of the magic here, even with some careful masking. But soon it was completely transformed simply by using filters, a pink colour in one, and blue in the other, these colours alone killed some of the unwanted overlapping images and so improved the scene dramatically. All these studies have been created by projecting on to a screen, but they could just as easily, have been on to a texture if one had wished. There have been a number of occasions when four projectors were in use together. However three have been the most that have normally been used, with the fourth one occasionally; simply projecting the author's signature in to the scene. 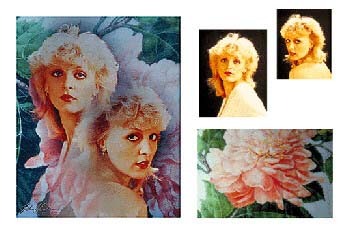 As an example see plate 31 (above), each portrait was projected individually, masked to blend together, and then the third transparency was of a part of an antique rice paper water colour painting, owned by the author. Most of this image was masked away leaving just the parts in view around the portraits. Incidentally, a signature, or in fact any text can be easily added to the picture. If the signature, or text required, is written in black on a white page, it can then be photographed with black and white film. The negative created now provides the signature, or text, in white against black. By projecting this negative, with a filter placed behind it, it can be made to appear in any colour desired.